The Tamil Tigers have vowed revenge after the man believed to be their number two was killed in a Sri Lankan air force raid. The military said SP Thamilselvan was at a meeting with other leaders in a camp when it was targeted on Friday. 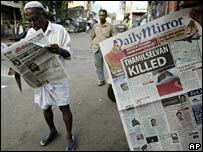 There are fears the killing could lead to an escalation of the war with the rebels, who want a Tamil state. 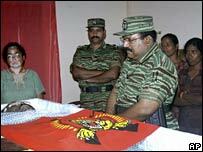 The rebels' top leader, Velupillai Prabhakaran, has made a rare public appearance to mourn his deputy. He was seen mourning at the open coffin of SP Thamilselvan, as whose body lay under the Tigers' flag, bandages covering wounds on his forehead. In a rare statement, Velupillai Prabhakaran said the death was "an unparalleled loss. "Our people are in profound shock and sorrow." The government, he said, "is sending war vultures that are dropping giant bombs, it has cruelly killed our peace dove". 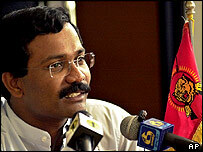 SP Thamilselvan led the rebel delegation at the last round of peace talks with the Sri Lankan government in late 2006. The Tamil Tigers' spokesman, Rasiah Ilanthiriyan, told the BBC the group's response to the killing would be in deeds, not words. But the rebel spokesman refused to be drawn on the manner of the retaliation they would take. He said it had to be a surprise. For its part, the government has described the killing as a major success. SP Thamilselvan was the head of the rebels' political wing and held an important position in their hierarchy. In areas they control, the Tigers have declared three days of mourning for SP Thamilselvan and the five others killed in the bombing raid. SP Thamilselvan's death follows that of another key rebel spokesman, Anton Balasingham, last year. Sri Lanka's Defence Secretary, Gotabaya Rajapaksa, said: "If we want we can take them one by one, so they must change their hideouts." The rebels announced on Friday their police chief, P Nadesan, would replace Mr Thamilselvan. He will also remain in charge of police. The pro-rebel TamilNet website said the air strike had been carried out in Kilinochchi, the rebels' northern stronghold. It followed a Tamil Tiger attack on an air force base at Anuradhapura last week which left 14 security forces personnel dead and destroyed eight aircraft.